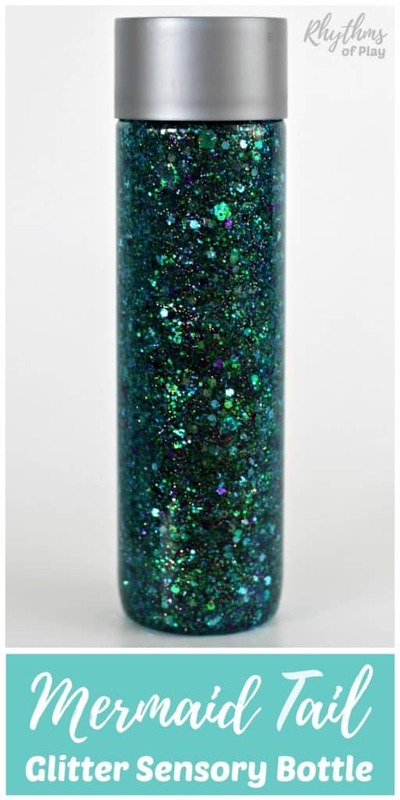 Give this gorgeous glitter sensory bottle a shake to see it swirl, sparkle, and SHINE just like a mermaid’s tail! 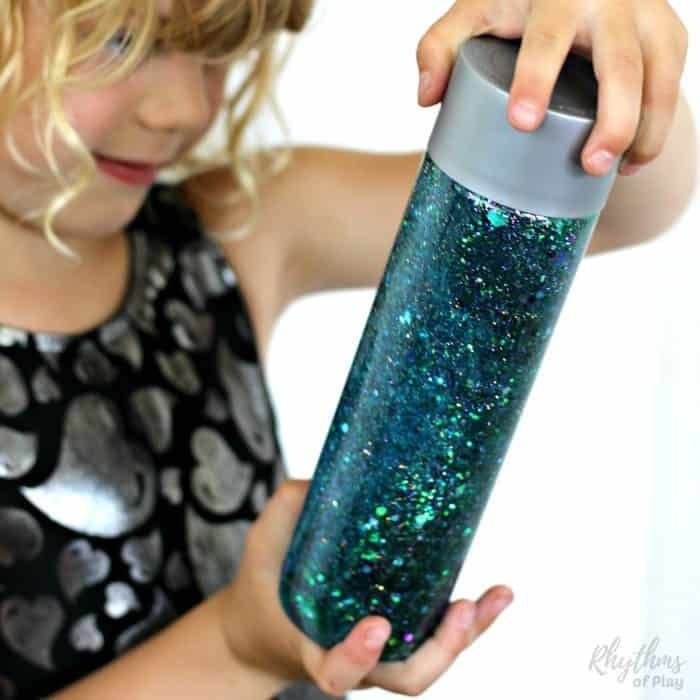 Calm down discovery jars like this glittering mermaid tail sensory bottle can be used for portable no mess safe sensory play, calming an overwhelmed child, and helping children learn to self-regulate. They are just as effective for adults. Gather the mermaid tail glitter sensory bottle supplies listed below and follow the easy step by step directions to make your own glittering mermaid tail. Remove Lable from Voss Water Bottle and use Goo Gone to remove any sticky residue. Pour 1 1/2 cups of super hot (boiling is best) water into a 1-quart measuring cup. Squeeze 1/3 bottle (2 oz) of blue glitter glue or 2 oz of clear glue into the hot water. Add pinches and shakes of hexagon glitter, flake glitter, and fine glitter in color combination of choice. The hexagons and flakes give the appearance of mermaid tail scales while the fine glitter fills out the bottle to make it look more like the tail of a mermaid. 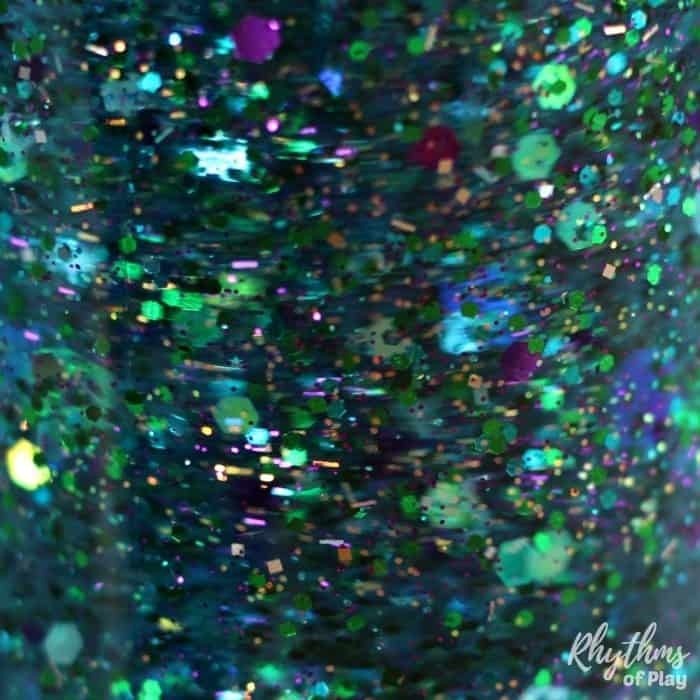 We used an assortment of blues, greens, and purples for the glitter sensory bottle pictured. Get creative and have fun making gorgeous glittering mermaid tails with the kids! Give it a final stir and quickly pour the mixture into your bottle. You may need to use your fingers to get some of the glitters into your bottle, but don’t worry about every last flake. Add a drop or two of liquid watercolors (not too much, a tiny drop goes a LONG way) to give your bottle a primary color. We used aqua-blue for this bottle. Place the lid on the mermaid tail bottle and give it a shake to see if you like it. Need more glitter or liquid watercolor? Add it in before topping it off with water. Play with your mermaid tail glitter sensory bottle for a day or two to make sure you are happy with it before gluing it shut. Need more glitter? Add more! To learn everything there is to know about calming jars check out Sensory bottles 101. 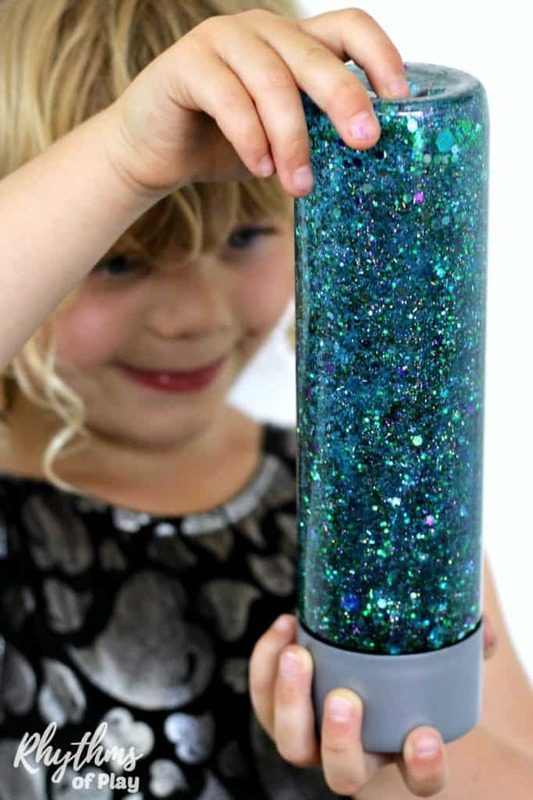 Both children and adults will love this gorgeous mermaid tail glitter sensory bottle recipe. Calm down bottles like mermaid tail are most often used for portable no mess “safe” sensory play, to help calm an overwhelmed child, as a “time out” timer, or as a meditation technique for children. They are just as effective for adults. Weighted mermaid pillows also make great calming tools for children. Reading books that help children understand their feelings and playing social-emotional games are more great ways to help children learn to self-regulate. You may also like this fun collection of under the sea ocean art projects for kids. There is even a mermaid template your children can use to paint their own mermaid. Can I just add the glue, glitter, and hot water in the VOSS bottle and shake to combine? Is there a purpose to the whisking instead? Good question Stacie, thank you for asking! You can just add the glue, glitter and hot water in the Voss bottle (or another recycled bottle), yes, but the water must NOT be boiling or it WILL melt the bottle. Believe me, I’ve done it! The purpose of using boiling water and whisking it in a quart mixing jar first is to make sure that the glitter does not clump. The long answer is that you can do it either way, but mixing it in the bottle is risky! Good luck!